Chimneys are very complicated to repair and maintain. 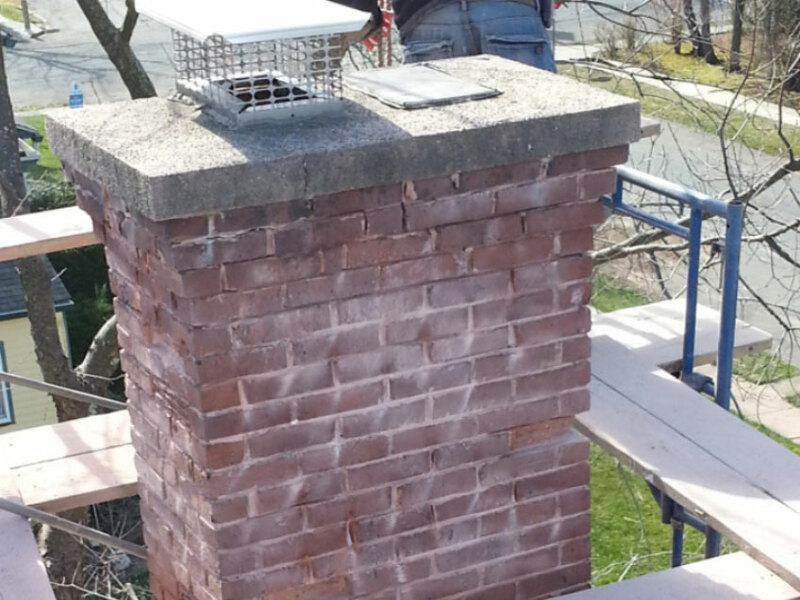 Patching the damaged areas of a chimney is usually only a temporary solution. 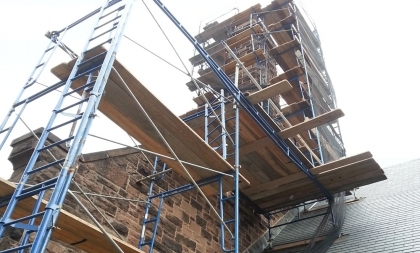 If the proper restoration is not performed, the chimney is left vulnerable to several hundreds, if not thousands, of dollars of future repair costs. 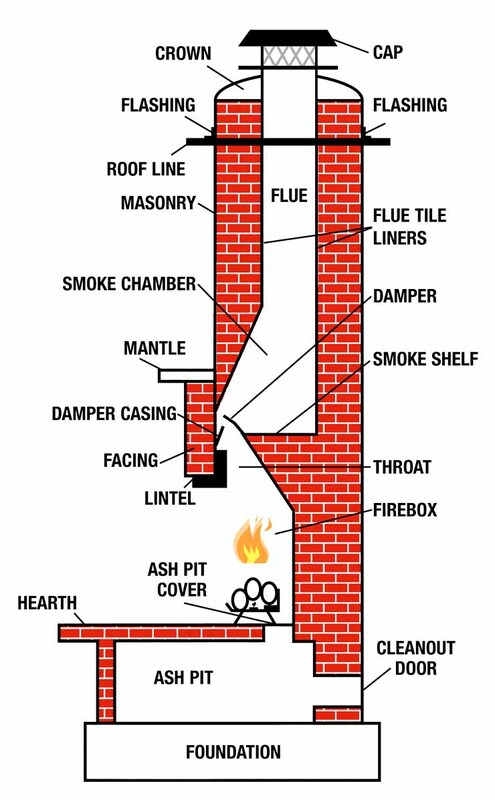 It is not only critical to know how to fix the current problem, but to understand how it occurred, and to protect the rest of the chimney structure from future complications. 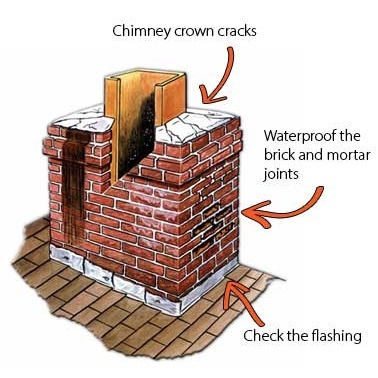 Often, chimney leaks can come from cracks in the chimney crown, flashing, deteriorated mortar joints, and/or moisture penetration through the pores of the bricks and mortar. 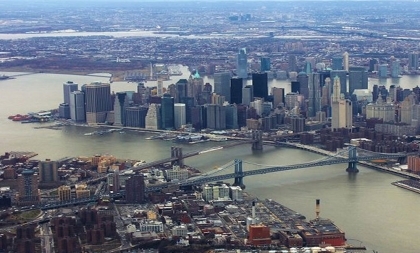 Other variables that cause these problems to occur can be linked to the age of the chimney, material used to build the chimney, and craftsmanship. Usually, problems with crowns occur because they are made from just a half inch of plain masonry cement. Masonry cement does not have reliable bonding properties, as it is delicate, brittle and rigid. The crown commonly cracks within a couple of years due to freezing-thawing cycles. Once the cracks occur, water works its way into the crown, which then freezes, expands and starts loosening the bricks from the mortar. This will slowly cause the chimney to fall apart from the top down. By the time realization of this occurrence happens, the top portion of the chimney is loose and usually needs to be taken down and rebuilt. 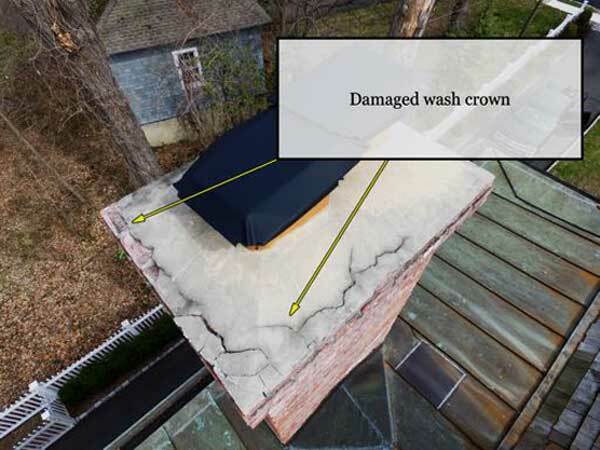 When we perform these types of repairs, we flair the top 3 to 4 courses of bricks out ½” per course to create a 1 ½” to 2” drip edge to make the water fall down to the roof or ground. 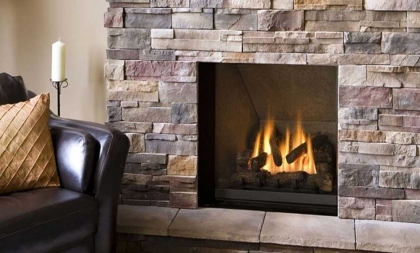 This will prevent future damage by not having the water run down the body of chimney and seep into weak areas. 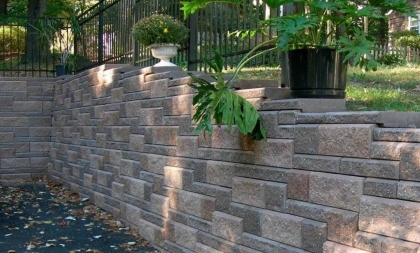 In addition, Sposato Masonry tints our mortars to blend into the existing mortar joints as much as possible. 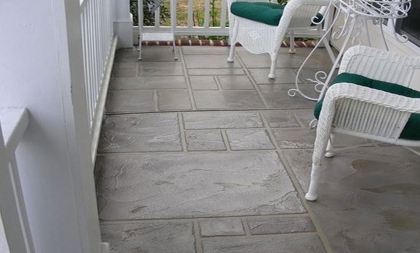 This creates a solid appearance and the repaired areas are hardly noticeable. Our crowns are made from a high psi polymer modified cement mix. Polymer increases freezing-thawing durability, flexibility and bonding properties in cement mixes. It also makes the cement more waterproof to keep the inner structure of the chimney protected from moisture. 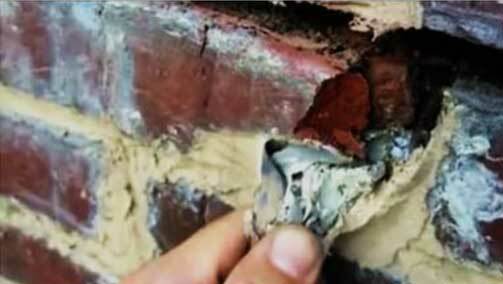 Another main repair factor that needs to be accounted for is deteriorated mortar joints. Mortar joints are 4” in depth the size of the bricks. 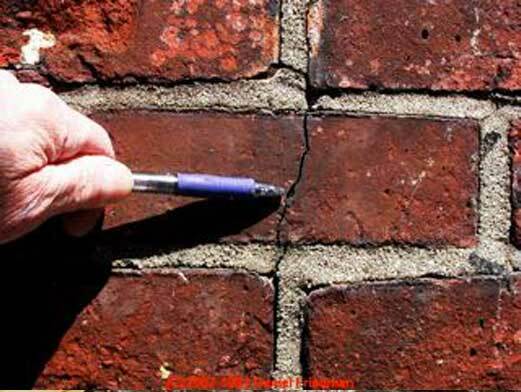 Mortar joints usually crack due to freezing-thawi or corrosion which causes deterioration from the outside in. 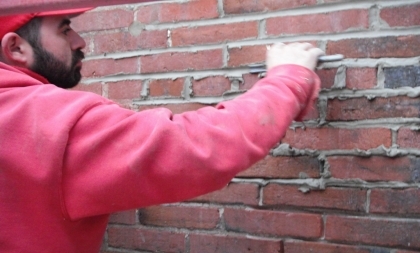 When repointing is performed, we can only grind out roughly ¾’ of the damaged mortar. New mortar is then installed over the remaining mortar to seal the surface and keep water out. The problem with majority of pointing work is that it is performed with standard mortar. 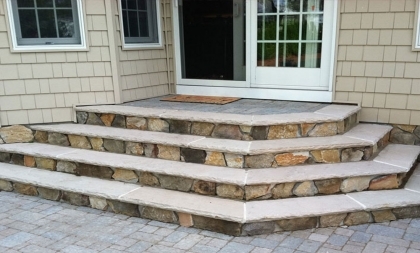 Standard mortar again has poor bonding qualities, especially to older cement, and is not flexible or waterproof. When polymer modified mortar is used, it has superior bonding properties. It is plastic cement and basically becomes one with the mortar behind it and brick around it. It also has waterproofing properties which helps keep the moisture out. 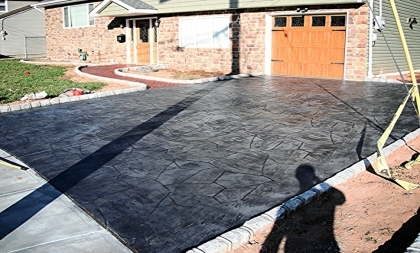 Some moisture can be absorbed; however the cement can handle the movement of the freezing-thaw due to its flexibility. 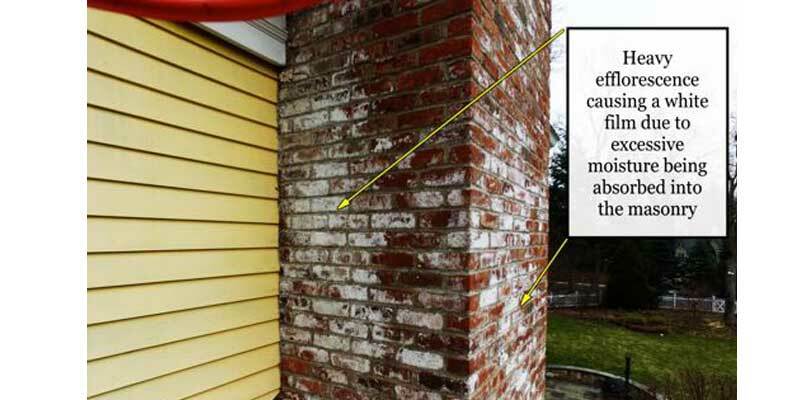 Spalling and efflorescence is also another major chimney repair issue that is commonly improperly addressed. 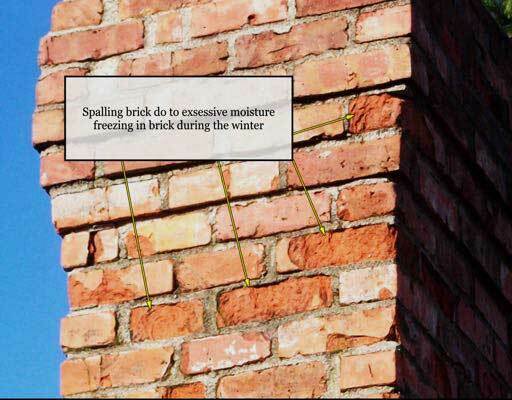 Spalling occurs when the brick absorbs moisture which freezes and expands in the winter time. After many winter seasons, the face of the bricks start bursting deteriorating the brick from the outside in. 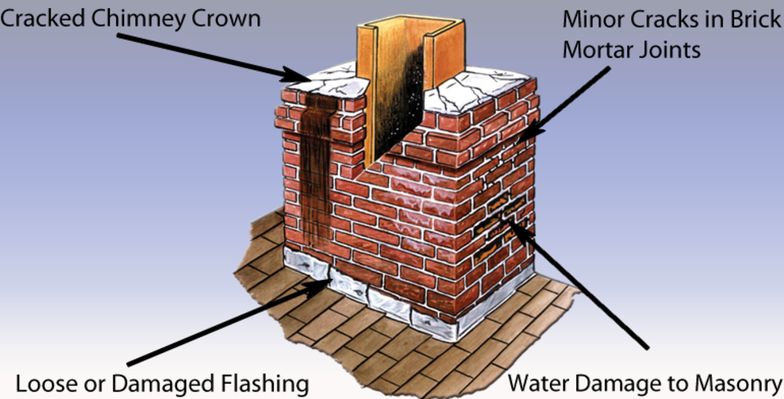 Efflorescence is caused by excessive moisture penetration through the masonry of the chimney. 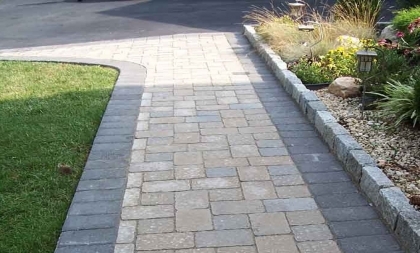 Efflorescence is a chemical reaction caused by the water reacting with the lime in the cement, which creates salt crystals that are pushed out to the surface. 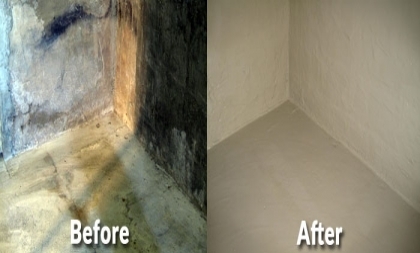 There are Efflorescence removers on the market, but it is very difficult to remove, and can sometimes not even be totally removed from the chimney. To resolve this issue, a penetrating 10 year water proofing sealer is applied to entire chimney. The sealer penetrates and clogs the pores of the bricks and mortar to create an invisible waterproof barrier to keep water and moisture out. Spalling occurs when bricks absorb too much moisture in the winter months, where the water within the bricks freezes and expands, causing the face of the bricks to burst. 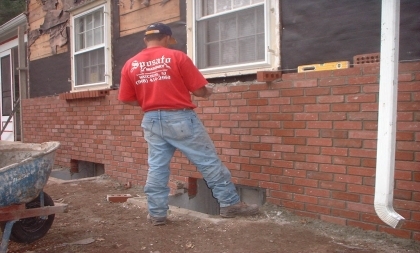 Spalling is addressed by cutting out and replacing or refacing spalled bricks.Here at Sposato Masonry we have specialized equipment to cut out, remove and replace these bricks when possible. 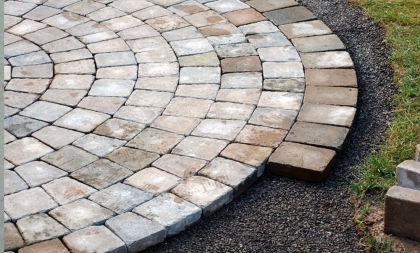 The removal and replacement of bricks cannot always be accomplished do to the vibration during removal. This vibration can cause the surrounding bricks to loosen, or also damage the surrounding bricks. In these situations we carefully ground out the damaged bricks until the solid body of the brick is exposed. We then use specialized bonding cement and adhere a 1/2" brick veneer facing over the remaining solid body of the previous brick. After that, we Tuck-point the mortar joints surrounding the bricks to lock the brick in place. We have been using this method for the past 8 years, and have never had one failure due to the specialized bonding cements and techniques we use when bonding the veneers in place. 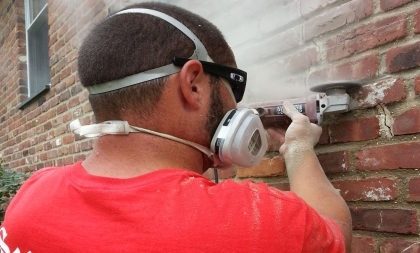 Applying caulking or silicon over damaged mortar joints, rather than proper masonry Tuckpointing, is not only an improper repair method, but it also creates further deterioration by trapping moisture in the masonry behind the mortar. The trapped moisture will cause damage during the winter when it freezes and expands, while also deteriorating the mortar joints and bricks around it. 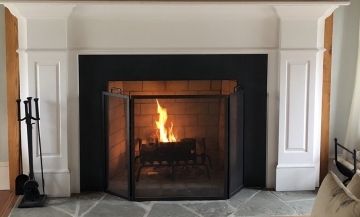 Any caulking or silicon should be removed from the chimney and replaced with proper breathable masonry material to allow moisture trapped within the masonry to evaporate evenly, rather than being trapped in certain areas. Efflorescence is the result of masonry material (brick or mortar) absorbing too much water. The water reacts with lime and other elements that make up the masonry material, which in turn causes salt particles to raise to the surface of the masonry. When the exterior moisture evaporates from the masonry, this leaves behind a chalky, unsightly white film. Efflorescence in itself is only a cosmetic issue, however it gives an indication that bricks and mortar are absorbing too much water. If remained untreated, this excess buildup of moisture would lead to spalling, cracking, and separation of bricks from mortar, especially when the water freezes and thaws during the winter months. 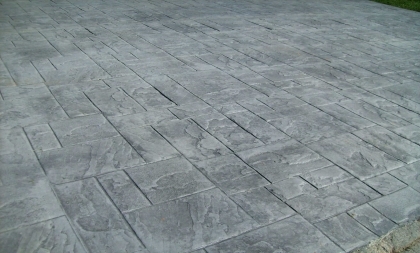 Efflorescence is very stubborn and difficult to remove. 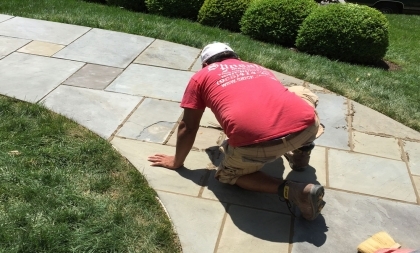 We use high psi power-washers,specialized masonry acids and detergents to remove the efflorescence as much as possible without causing further damage to the masonry. Using conventional cheap acids to remove the efflorescence can severely etch and causes the masonry to become highly porous. Leaving the masonry porous allows too much water to be absorbed, which would then freeze and expand during winter months, causing further damage the masonry structure. The bricks are the actual strength in a chimney. The mortar within the bricks acts more like a glue to hold the bricks together. Mortar in itself varies in strength anywhere between 750psi to 2500 psi. The strength of average concrete bricks however, varies between 4,000psi to 6,000psi, and clay bricks vary from 8,000psi to 10,000 psi. When Vertical Cracking is found through bricks, it means that the structure split. When repairing, most masons grind open the cracks (which only accelerates the damage caused by freeze-thaw) and fill the crack with mortar. This is an incorrect method, because the repair does nothing for the strength of the chimney, and will crack and delaminate within just a few years. Stitching is the best repair method in this situation. Stitching is similar to when we have a wound that requires stitches. Stitching consists of grinding out the horizontal mortar joints every couple of courses of bricks depending on the size of the crack. Steel rods are then embedded in horizontal joints within the pointing mortar, to help reinforce the structure and hold everything together. the spalling of bricks. 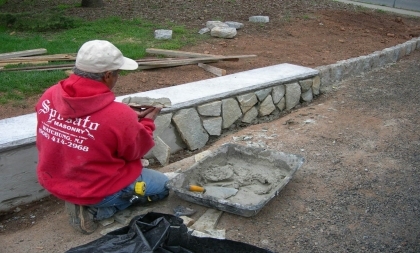 Sposato Masonry has different methods of repairing and replacing crowns to avoid these issues. 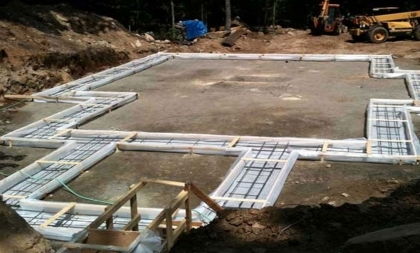 We use high psi cements in addition to additives that increase freeze-thaw durability and flexibility. We also use reinforcements in our crown mixes as well, which mimic steel reinforcement used in load-bearing concrete.